1.1. What is a Rule Engine? Artificial Intelligence (A.I.) is a very broad research area that focuses on "Making computers think like people" and includes disciplines such as Neural Networks, Genetic Algorithms, Decision Trees, Frame Systems and Expert Systems. Knowledge representation is the area of A.I. concerned with how knowledge is represented and manipulated. Expert Systems use Knowledge representation to facilitate the codification of knowledge into a knowledge base which can be used for reasoning, i.e., we can process data with this knowledge base to infer conclusions. Expert Systems are also known as Knowledge-based Systems and Knowledge-based Expert Systems and are considered to be "applied artificial intelligence". The process of developing with an Expert System is Knowledge Engineering. EMYCIN was one of the first "shells" for an Expert System, which was created from the MYCIN medical diagnosis Expert System. Whereas early Expert Systems had their logic hard-coded, "shells" separated the logic from the system, providing an easy to use environment for user input. Drools is a Rule Engine that uses the rule-based approach to implement an Expert System and is more correctly classified as a Production Rule System. The term "Production Rule" originates from formal grammars where it is described as "an abstract structure that describes a formal language precisely, i.e., a set of rules that mathematically delineates a (usually infinite) set of finite-length strings over a (usually finite) alphabet" (Wikipedia). Business Rule Management Systems build additional value on top of a general purpose Rule Engine by providing business user focused systems for rule creation, management, deployment, collaboration, analysis and end user tools. Further adding to this value is the fast evolving and popular methodology "Business Rules Approach", which is a helping to formalize the role of Rule Engines in the enterprise. The term Rule Engine is quite ambiguous in that it can be any system that uses rules, in any form, that can be applied to data to produce outcomes. This includes simple systems like form validation and dynamic expression engines. The book "How to Build a Business Rules Engine (2004)" by Malcolm Chisholm exemplifies this ambiguity. The book is actually about how to build and alter a database schema to hold validation rules. The book then shows how to generate VB code from those validation rules to validate data entry. This, while a very valid and useful topic for some, caused quite a surprise to this author, unaware at the time in the subtleties of Rules Engines' differences, who was hoping to find some hidden secrets to help improve the Drools engine. JBoss jBPM uses expressions and delegates in its Decision nodes which control the transitions in a Workflow. At each node it evaluates ther is a rule set that dictates the transition to undertake, and so this is also a Rule Engine. While a Production Rule System is a kind of Rule Engine and also an Expert System, the validation and expression evaluation Rule Engines mentioned previously are not Expert Systems. A Production Rule System is Turing complete, with a focus on knowledge representation to express propositional and first order logic in a concise, non-ambiguous and declarative manner. The brain of a Production Rules System is an Inference Engine that is able to scale to a large number of rules and facts. 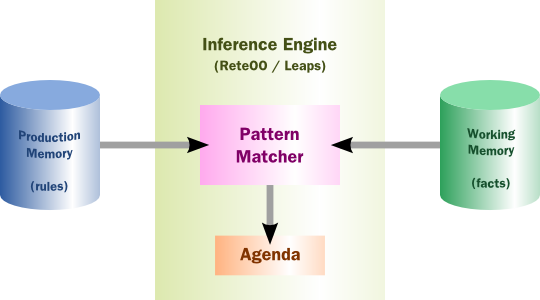 The Inference Engine matches facts and data against Production Rules - also called Productions or just Rules - to infer conclusions which result in actions. A Production Rule is a two-part structure using First Order Logic for reasoning over knowledge representation. Drools implements and extends the Rete algorithm; Leaps used to be provided but was retired as it became unmaintained. The Drools Rete implementation is called ReteOO, signifying that Drools has an enhanced and optimized implementation of the Rete algorithm for object oriented systems. Other Rete based engines also have marketing terms for their proprietary enhancements to Rete, like RetePlus and Rete III. The most common enhancements are covered in "Production Matching for Large Learning Systems (Rete/UL)" (1995) by Robert B. Doorenbos. There are two methods of execution for a rule system: Forward Chaining and Backward Chaining; systems that implement both are called Hybrid Chaining Systems. As of Drools 5.2 Drools provides seamless hybrid chaining, both forward and backwards. Understanding these two modes of operation is the key to understanding why a Production Rule System is different and how to get the best from it. Forward chaining is "data-driven" and thus reactionary, with facts being asserted into working memory, which results in one or more rules being concurrently true and scheduled for execution by the Agenda. In short, we start with a fact, it propagates and we end in a conclusion. What advantage does a rule engine have over hand coded "if...then" approaches? Why should you use a rule engine instead of a scripting framework, like BeanShell? We will attempt to address these questions below. Rule engines allow you to say "What to do", not "How to do it". The key advantage of this point is that using rules can make it easy to express solutions to difficult problems and consequently have those solutions verified. Rules are much easier to read than code. Rule systems are capable of solving very, very hard problems, providing an explanation of how the solution was arrived at and why each "decision" along the way was made (not so easy with other of AI systems like neural networks or the human brain - I have no idea why I scratched the side of the car). Your data is in your domain objects, the logic is in the rules. This is fundamentally breaking the OO coupling of data and logic, which can be an advantage or a disadvantage depending on your point of view. The upshot is that the logic can be much easier to maintain as there are changes in the future, as the logic is all laid out in rules. This can be especially true if the logic is cross-domain or multi-domain logic. Instead of the logic being spread across many domain objects or controllers, it can all be organized in one or more very distinct rules files. The Rete algorithm,the Leaps algorithm, and their descendants such as Drools' ReteOO, provide very efficient ways of matching rule patterns to your domain object data. These are especially efficient when you have datasets that change in small portions as the rule engine can remember past matches. These algorithms are battle proven. By using rules, you create a repository of knowledge (a knowledge base) which is executable. This means it's a single point of truth, for business policy, for instance. Ideally rules are so readable that they can also serve as documentation. Tools such as Eclipse (and in future, Web based user interfaces) provide ways to edit and manage rules and get immediate feedback, validation and content assistance. Auditing and debugging tools are also available. 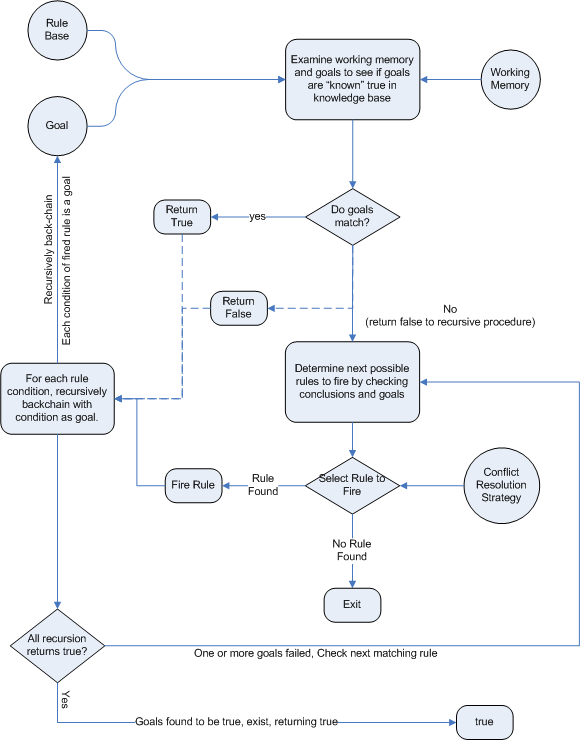 Rule systems effectively provide an "explanation facility" by being able to log the decisions made by the rule engine along with why the decisions were made. By creating object models and, optionally, Domain Specific Languages that model your problem domain you can set yourself up to write rules that are very close to natural language. They lend themselves to logic that is understandable to, possibly nontechnical, domain experts as they are expressed in their language, with all the program plumbing, the technical know-how being hidden away in the usual code. The problem is just too fiddle for traditional code. The problem may not be complex, but you can't see a non-fragile way of building a solution for it. The problem is beyond any obvious algorithmic solution. It is a complex problem to solve, there are no obvious traditional solutions, or basically the problem isn't fully understood. The logic itself may even be simple but the rules change quite often. In many organizations software releases are few and far between and pluggable rules can help provide the "agility" that is needed and expected in a reasonably safe way. Domain experts often possess a wealth of knowledge about business rules and processes. They typically are nontechnical, but can be very logical. Rules can allow them to express the logic in their own terms. Of course, they still have to think critically and be capable of logical thinking. Many people in nontechnical positions do not have training in formal logic, so be careful and work with them, as by codifying business knowledge in rules, you will often expose holes in the way the business rules and processes are currently understood. Typically in a modern OO application you would use a rule engine to contain key parts of your business logic, especially the really messy parts. This is an inversion of the OO concept of encapsulating all the logic inside your objects. This is not to say that you throw out OO practices, on the contrary in any real world application, business logic is just one part of the application. If you ever notice lots of conditional statements such as "if" and "switch", an overabundance of strategy patterns and other messy logic in your code that just doesn't feel right: that would be a place for rules. If there is some such logic and you keep coming back to fix it, either because you got it wrong, or the logic or your understanding changes: think about using rules. If you are faced with tough problems for which there are no algorithms or patterns: consider using rules. It seems to me that in the excitement of working with rules engines, that people forget that a rules engine is only one piece of a complex application or solution. 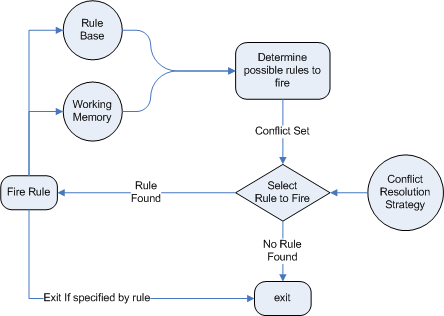 Rules engines are not really intended to handle workflow or process executions nor are workflow engines or process management tools designed to do rules. Use the right tool for the job. Sure, a pair of pliers can be used as a hammering tool in a pinch, but that's not what it's designed for. Hopefully the preceding sections have explained when you may want to use a rule engine. Alternatives are script-based engines that provide the drive for "changes on the fly", and there are many such solutions. Alternatively Process Engines (also capable of workflow) such as jBPM allow you to graphically (or programmatically) describe steps in a process. Those steps can also involve decision points which are in themselves a simple rule. Process engines and rules often can work nicely together, so they are not mutually exclusive. One key point to note with rule engines is that some rule engines are really scripting engines. The downside of scripting engines is that you are tightly coupling your application to the scripts. If they are rules, you are effectively calling rules directly and this may cause more difficulty in future maintenance, as they tend to grow in complexity over time. The upside of scripting engines is that they can be easier to implement initially, producing results quickly, and are conceptually simpler for imperative programmers. Many people have also implemented data-driven systems successfully in the past (where there are control tables that store meta-data that changes your applications behavior) - these can work well when the control can remain very limited. However, they can quickly grow out of control if extended too much (such that only the original creators can change the applications behavior) or they cause the application to stagnate as they are too inflexible. No doubt you have heard terms like "tight coupling" and "loose coupling" in systems design. Generally people assert that "loose" or "weak" coupling is preferable in design terms, due to the added flexibility it affords. Similarly, you can have "strongly coupled" and "weakly coupled" rules. Strongly coupled in this sense means that one rule "firing" will clearly result in another rule firing, and so on; in other words, there is a clear (probably obvious) chain of logic. If your rules are all strongly coupled, the chances are that the will turn out to be inflexible, and, more significantly, that a rule engine is an overkill. A clear chain can be hard coded, or implemented using a Decision Tree. This is not to say that strong coupling is inherently bad, but it is a point to keep in mind when considering a rule engine and the way you capture the rules. "Loosely" coupled rules should result in a system that allows rules to be changed, removed and added without requiring changes to other, unrelated rules.